Woke up Saturday, and thought Birdie had broken his leg. He didn't seem to be in pain: ate fine, took a bath, sang, chirped. And since no vet is open in this town, I had to wait. Called bright and early Monday, got an appointment with the bird specialist. Vet said the leg wasn't broken. There was neurological damage. Birdie can't use his left leg. It hangs there. Vet said there was nothing to be done. Ok, I can deal. Brought Birdie home and put him back in the cage. 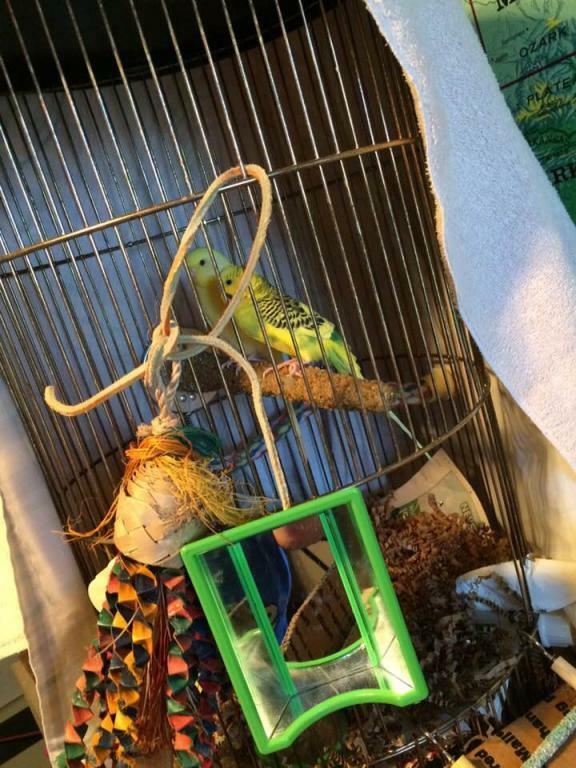 Now Birdie has a girlfriend, named Tulip. They've been together for three or four years with no problems whatsoever. A week after the trip to the vet, Tulip decides Birdie must die. She followed him around the cage and attacked him. I thought it would blow over. But I have since separated the two. My problem is Birdie seems frantic to get back in the her cage. He's climbing all over searching for a door. He won't shut up, like when one has gotten loose and the two of them call to each other until the lost one finds his/her way back. It's not like their in a different room, their right next to each other. I've even switch cages, thinking he would be happy in the old cage. Nope. Still getting the chirp of the lost bird. I am so tore. Let him back in, keep them apart. Is this like the chicken thing where she'll peck him to death? This is a pic showing the leg dangling. If anyone has any information about how to help the neurological damage, I would appreciate it. They didn't live in that cage, that's their "tree." There is a much larger play area they walk to for eating, bathing, playing. Last edited by starlina; 03-21-2019 at 02:08 PM. otherwise, is he eating well? I'm very sorry about Birdie's problem. You are definitely going to have to keep Birdie and Tulip separated permanently. Otherwise Tulip will severely injure or kill him. How did the vet determine the damage was neurological? What is the prognosis for the leg? Will the tissue die or will the leg simply be "useless"? Are you going to take steps to create a cage for Birdie so he can get around more easily and that wil accommodate his disability? I recommend you keep Birdie's cage in a separate room from where Tulip's cage is. You can play music in both rooms to help muffle the bird sounds so Birdie isn't so anxious to try to get back to Tulip. I'm so sorry this happened to your little one You've been given great advice. I know he's frantic now but it's important to separate them or Tulip will seriously hurt him. Be sure to read through the links provided above to ensure you're up to date on the best of budgie care practices! If you have any questions after doing so, please be sure to ask as we'd love to help. My little guy is eating, bathing, and singing. He climbs all over. He's very alert. His biggest thing is to try to get back in which ever cage she is in. It isn't possible, but he's single minded in his task. It worries me, because it's like he is driven. The vet said that due to his age, he's almost ten, he wasn't sure any surgery was possible. He took several xrays, no broken bones, nothing out of the ordinary. Are you going to take steps to create a cage for Birdie so he can get around more easily and that will accommodate his disability? Thank you for taking the time to include all the links. I'll start reading on my lunch break. The vet said he's seen it alot over the years. It's the way the foot curled. He said Birdie might come out of it on his own. Otherwise, the foot will remain useless. He took a lot of xrays and showed the pictures to me, explaining things as he went. Birdie is eating his vegies and fruits, taking baths in his water ladden spinach. He acts like nothing is wrong, except for his insane need to get back in with Tulip. I've ordered a new cage for him off of Amazon. Last edited by FaeryBee; 03-22-2019 at 05:39 PM. I'm glad you've ordered a new cage for Birdie. Putting him in a separate room away from Tulip should help a lot.